"Water is a medium which intermediates the tangible with emotion and spirit. It flows between intention and its own laws of nature and serendipity- its a collaboration of sorts. Between the subtlety of complex colour transitions and the strength of dense, robust marks watercolour can make a strong statement and be monumental. It can have weight and gravity." "There is spirit and nature in the city. We can feel it., although we may not always know where to see it." The course of work has led to a focus on large format cityscapes and urban behaviour. 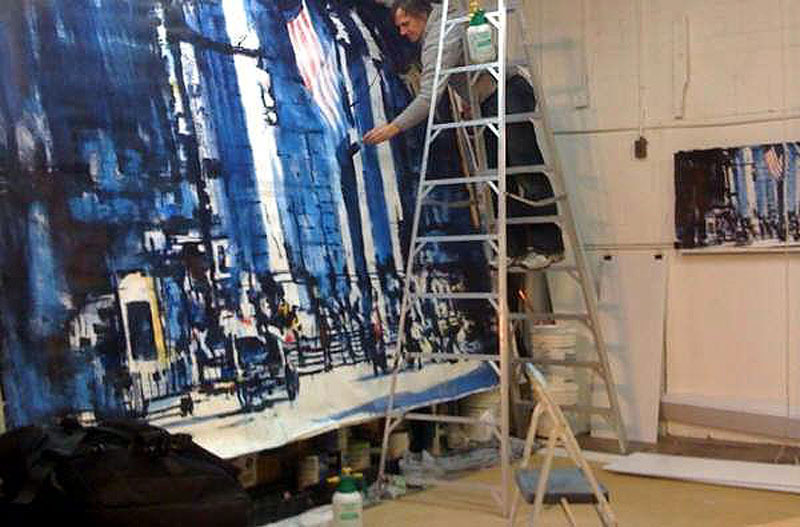 David paints primarily in Berlin, Vancouver andNew York. His work is included in corporate and private collections in Canada, USA, Europe and Asia. This work is evolved from life experience and our group memory of the city, an evocation of intersections and paradoxes that emerge in our urban landscape. There is a compelling relationship between people and their urban context as active organic objects living and flowing through the chasms of inorganic and commanding architecture. Beyond the strength and scale of the environment is nature as light and inspiration. This nature is overarching and lurks in the background; hidden, but its effects are ubiquitous. It creates a collective unity, embodying the spiritual - or perhaps just instinctive optimism. In street-level images, our personal momentary experience may bring less identifiable images of people as suppressed identity, these are a closer-up view of us flowing at the street level. Each is a transitory representation of the other and iconic of our daily experience. I want these to be memory faded, imperfect, reduced to optimize our personal capacity for memory. A memory that finally becomes iconic and common in its appearance and recollection. These shapes are not entirely descriptive but shown as we may process them unconsciously. These become points to contextualize our selves as we find ourselves acceptably contrapuntal to them. David has been influenced by Asian calligraphic and compositional work, Riopelle, Richter, de Kooning, Kline, Chu TehChun, Luc Tuymens and years rendering figure in watercolour. This work is moving towards a meeting of Asian-influenced energetic brushwork and low-resolution digitized realism. In electronic and ad media, less production value results in a more convincing and engaging hypothesis. The meaning and structure appears between intentionality and the freedom to allow pigment to flow. These sorts of binaries are what this work strives to evoke. As physical statements, these works are "artifacts"; deckled edges, push-pin marks, and scarred surface show signs of process. I want the paper to have its way with the pigment, water, and my actions so they speak clearly as an object not digitally reproducible. "I want to be adept, unsteady and brave at the easel." Die Kunst der Kaufhalle. Der kanadische Künstler David Antonides hat den Supermarkt an der Schwedter Straße Ecke Fürstenberger. Str. gemalt.